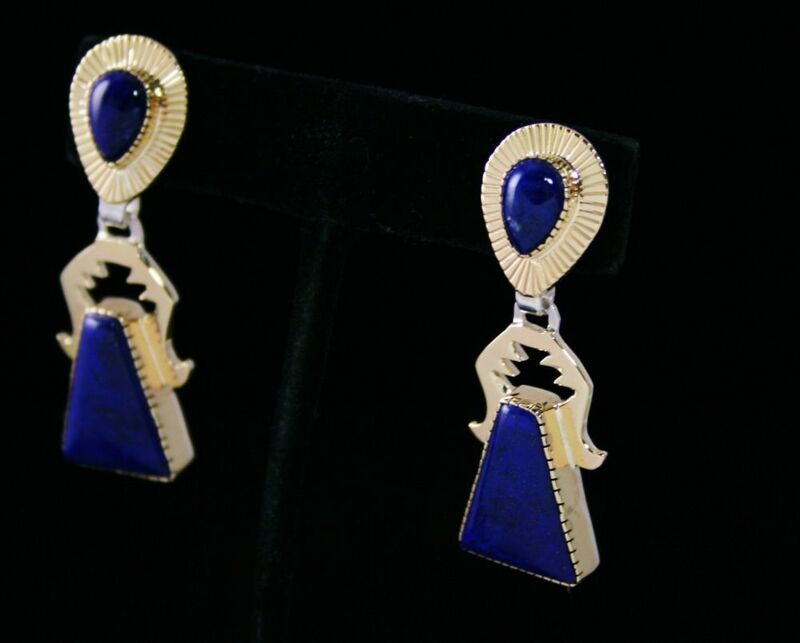 These dynamic earrings hand made by Wichita jeweler Dina Huntinghorse feature four perfectly matched lapis cabochons. 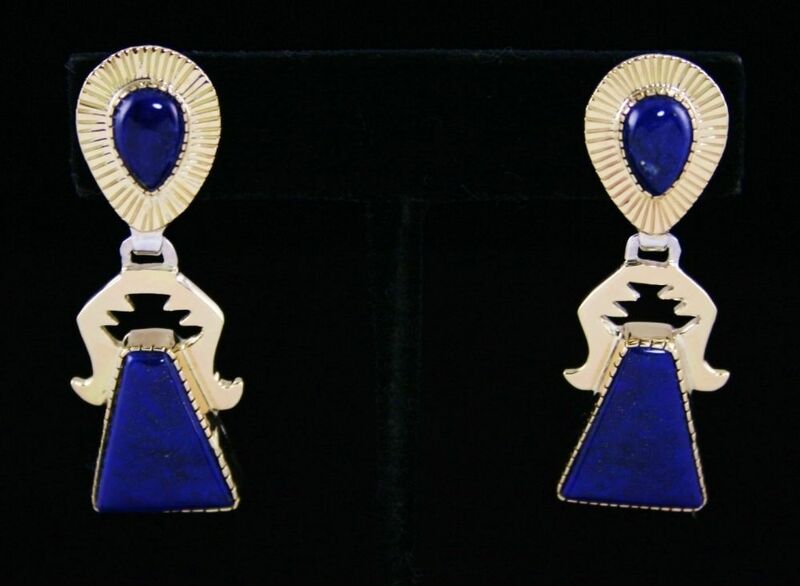 This deep blue natural lapis was collected by pioneer jeweler, Julian Lavato in the 1970s and is surrounded with superb detail. 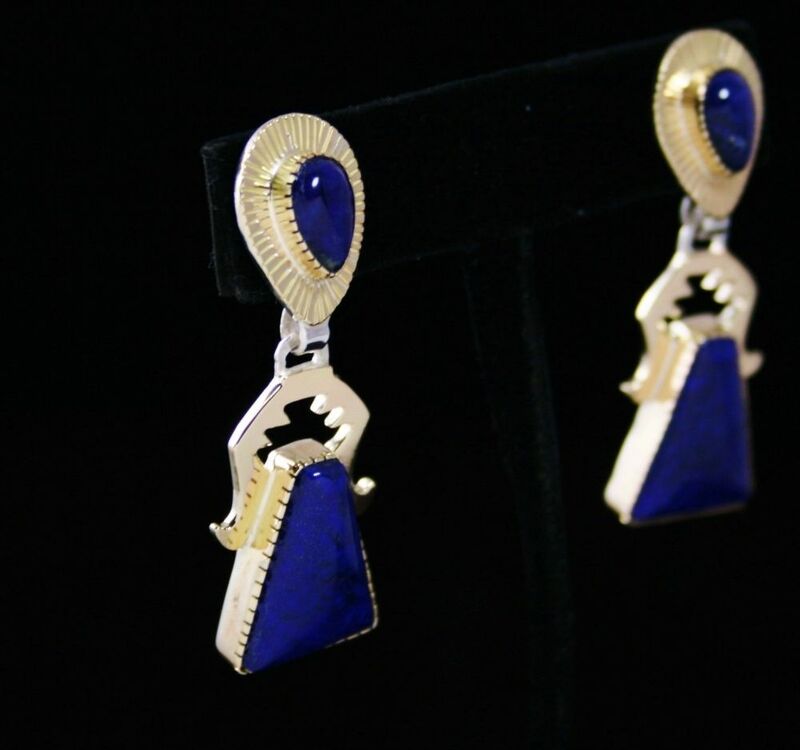 They are set in hand made solid 14 karat gold bezels. The post sections feature solid 14 karat gold overlaid sunburst designs attached to beautiful dangles elegantly overlaid with gleaming gold to match. 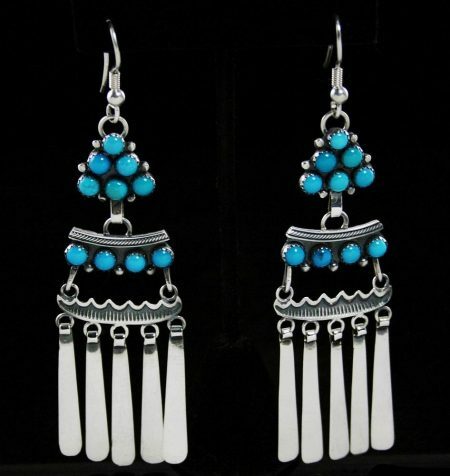 Earring Size Dangle Length Included: 1-7/8 in. x 9/16 in. 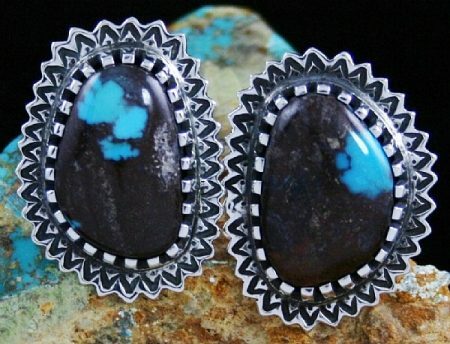 (at widest point) Lower Stone Size: 9/16 in. x 3/4 in. Post Section: 9/16 in. x 11/16 in. 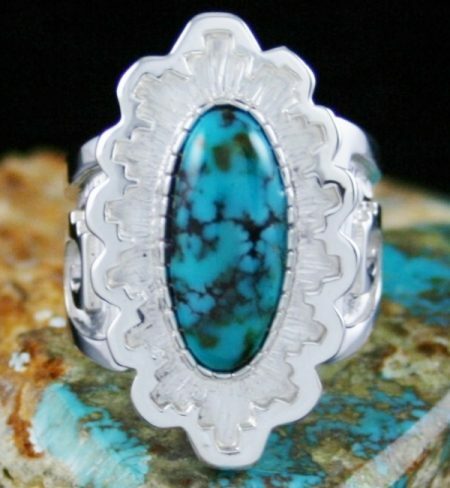 This beautiful ring created by Dina Huntinghorse features a fine gem grade natural Apache Blue turquoise set in a flower design atop a hand etched background. 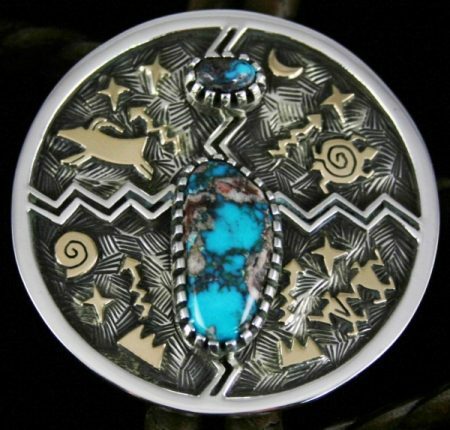 The gem exhibits a unique look from the mine with an electric deep blue hue, speckles of green and dark reddish-brown matrix. 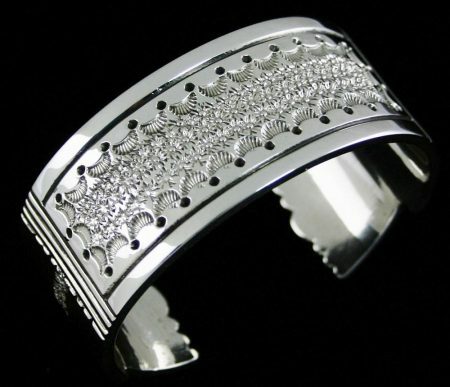 The shank of the ring is also over laid in a floral pattern signature to this gifted jeweler. 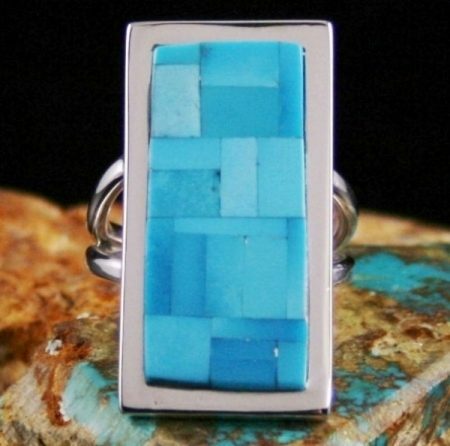 This simple but elegant ring was created by Tommy Jackson by choosing different shades of high grade natural Castle Dome turquoise and inlaying them stone to stone. 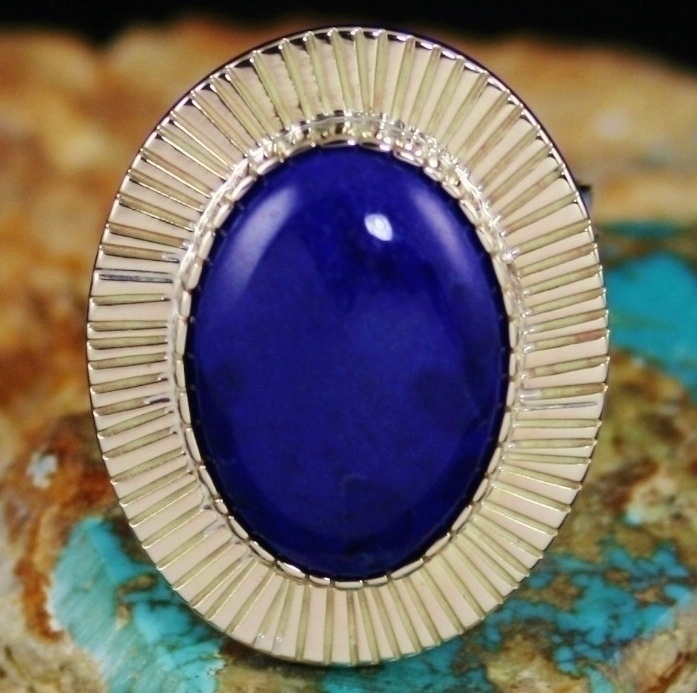 This creates a dazzling effect when worn on the finger. The finished ring is beautiful and desirable. 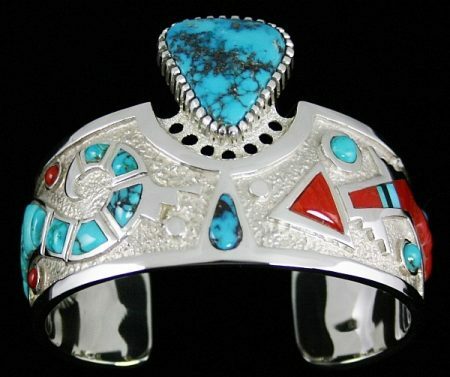 Navajo jeweler Al Joe has created this innovative bracelet from sterling silver. 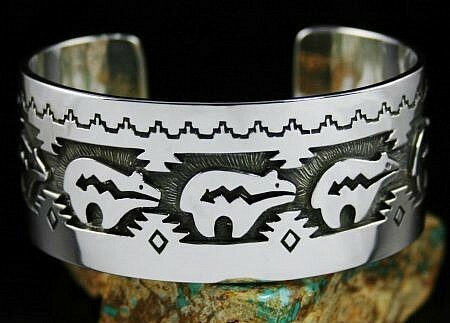 The bracelet has and inverse dome. 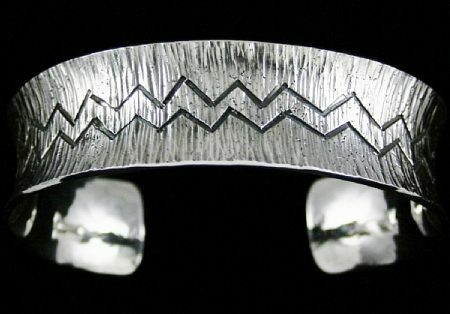 He has stamped a lightning design down the middle after texturing the entire band. 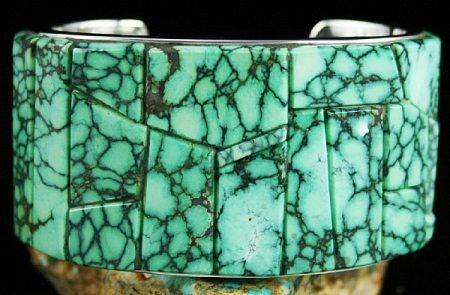 The piece is then deeply oxidized and buffed. 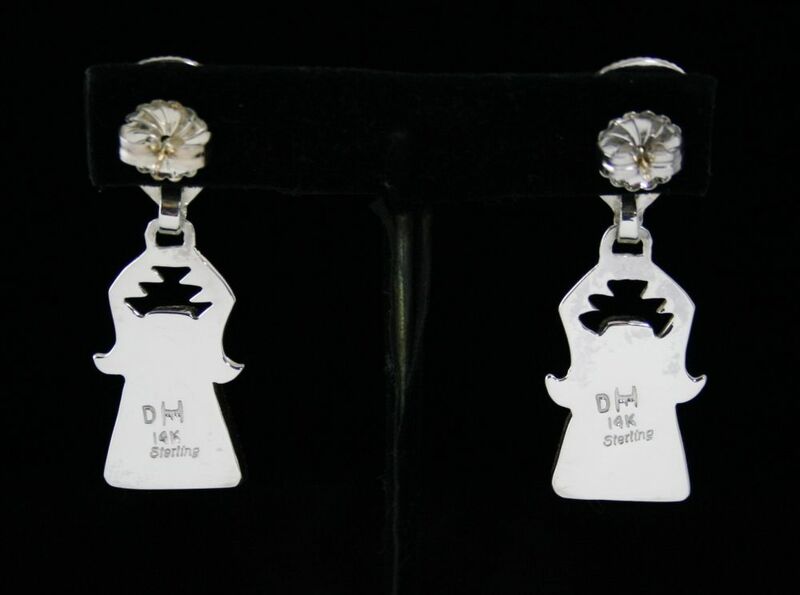 The finished piece is elegant and unusual, perfect for everyday attire. 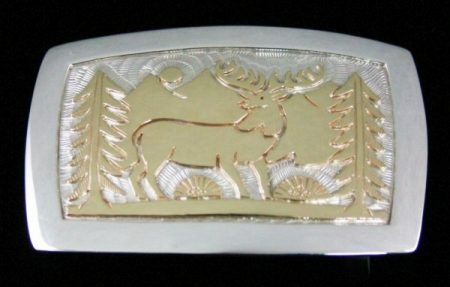 Watson Honanie has created this beautiful elk themed belt buckle by overlaying solid fourteen karat gold on sterling silver. The gold sheet is hand cut with a tiny saw to show a forest represented by the pine trees with a huge bull elk at high alert in a meadow below the towering mountain. The elk has a magnificent trophy rack mirrored by a shimmering sun. 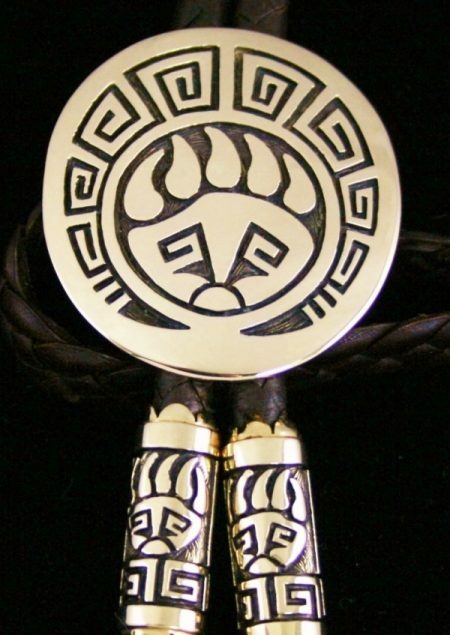 It is Watson's singular talent to create magnificent one of a kind designs with simple primitive tools. 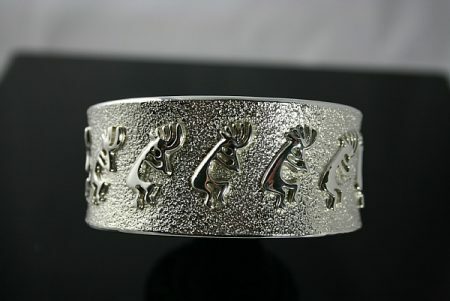 The buckle is finished by finely etching the sterling silver background. 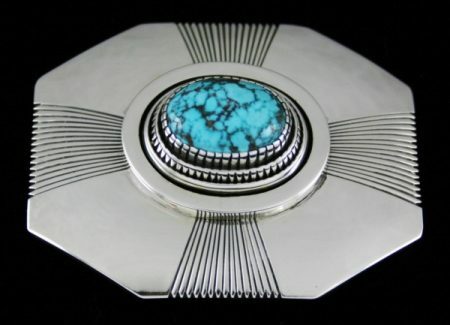 Leonard has used one of his simplest and cleanest designs to create this fine belt buckle. Rays of clean stamped lines flare from the center to the sides. 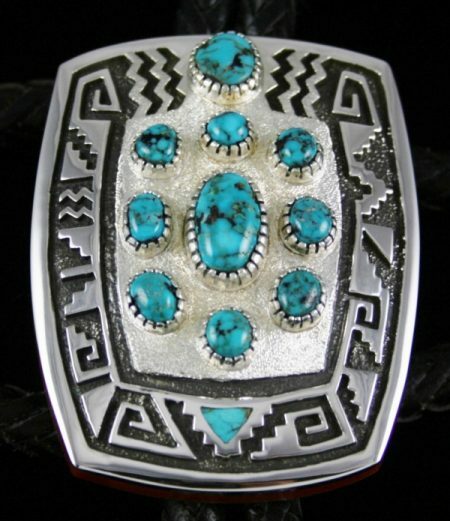 A gorgeous high domed gem grade natural red web Kingman turquoise sits in the middle of his signature stepped shadowbox design. 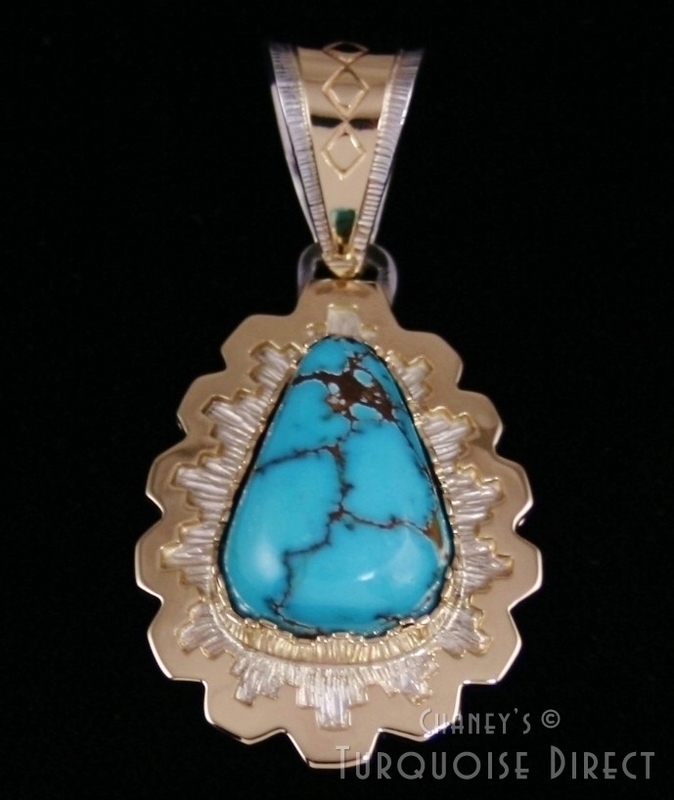 Multiple layers and a hand chiseled bezel beautifully compliment the beauty of the stone. The finished product is a classic.